According to Lenoir County Emergency Services Director Roger Dail, the search for the driver of the tractor-trailer that went off Highway 70 into the Neuse River early Sunday morning has been suspended for the night. He confirmed that there was a cab in the river along with the trailer, but did not have any updates regarding the identity of the driver or the owner of the vehicle, and the truck remains in the river at this time. Dail said that Highway 70 is still closed near the Neuse River bridge near Skinner's Bypass. We will continue to provide updates on this story as facts emerge. Neuse News Correspondent Catherine Hardee, Publisher B.J. Murphy and Columnist Jon Dawson contributed to this report. 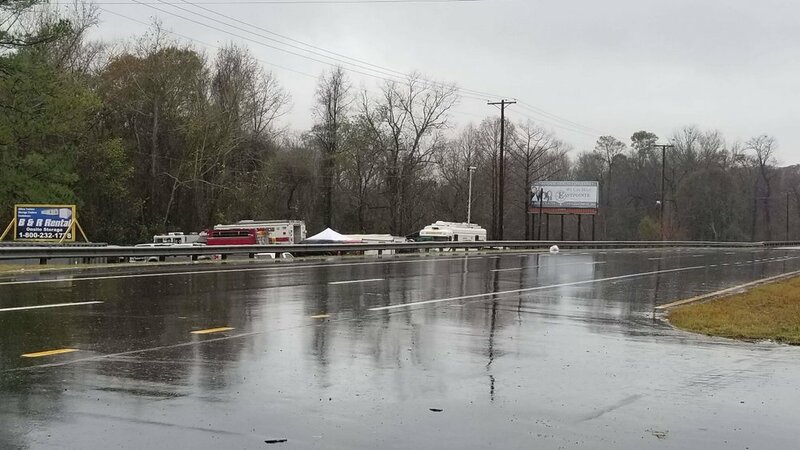 According to Len/oir County Emergency Services Director Roger Dail, there was an accident on a bridge over the Neuse River on U.S. 70 near Skinner’s Bypass that has completely submerged what appears to be a tractor-trailer. The accident occurred around 4 a.m., he said. Both sides of U.S. 70 are closed to all traffic while officials are trying to recover the vehicle. It is not known whether overnight inclement weather contributed to the accident. Rescue personnel from North Lenoir Volunteer Fire Department, Southwood VFD, Hugo VFD, Lenoir County Sheriff’s Office, the State Highway Patrol, N.C. Wildlife Office and a dive team are at the scene trying to discern what happened and to recover the vehicle and its inhabitants. He said the accident destroyed a section of bridge railing on U.S. 70. This story will be updated as facts emerge.